Kimberley was named after the First Earl of Kimberley, a British Liberal politician by the name of John Wodehouse. The first settlers to Kimberley began in the mid 1850’s. Some of the first families who settled here were named Hurd, Hurlburt, McLean and Magee. The next settlers were the Wicken’s family, who moved from Thornbury via team and wagon to Williamstown (today known as Heathcote). Williamstown was the oldest settlement of the area, with 2 stores, 2 hotels and a post office. From Williamstown, the Wicken’s family continued the journey to their new home by Indian canoe up the Beaver River. The voyage to purchase provisions was always done on foot. The late 1850’s brought more families to the valley. The Burritt’s, Carruthers, Ellis’s, Fawcett’s, Lawrence’s, McConnell’s, Merrick’s, Perry’s, Purdy’s, Stafford’s, Stuart’s, Thurston’s and Ward’s sought to plant ‘roots’ in this area thereby contributing to a thriving community. The log school was very small and the children had to sit on planks. By 1872 the seventy pupils needed a larger school and so a frame building, sheathed with white clapboard was erected on the opposite side of the street, west of the 3rd school now known as Peter & Mary Ferguson’s residence, which was erected in 1910. Cost of the new school was $6,000.00. The new school housed classrooms up to, and including, the first two years of secondary school. The schoolhouse was closed around 1956, when at this time the children were bussed to Flesherton. As for churches in the early days Wesleyan Methodists and Episcopal Methodists were most prominent. Later Presbyterian churches started to appear in the valley. The very first church in Kimberley was a Union church, with any denomination being allowed to worship. It later became a Methodist Church. Changing social and demographic conditions brought about diminishing church support. In the seventies the church was sold and became a private residence. A post office first came to Kimberley in 1868. William Purdy was the first postmaster. The post office was moved when Mr. Purdy’s health was ailing and moved to Alexander McLean’s home in 1872. In 1894 the post office was once again moved to the newly built Hammond store, where Mr. M.R. Hammond (former school teacher) was postmaster until his death in 1917. The Hammond family continued to operate the post office until 1925, at which time there were a number of changes and locations until its final closing in late 1989. Today the building is a private residence (Grey Rd 13, (main street) of Kimberley, almost directly across the Kimberley Community Hall). Right from the early settling days, the ‘Cuckoo Valley’, Kimberley, enjoyed a blessed and multitude of industrial and commercial activities. In 1861, John Hurlburt erected a sawmill which was followed by the (current ‘Grist Mill’) Mill House Store in 1864 owned by William Purdy. In 1872 John & William Plewes took over the Purdy house and gristmill and operated an apiary and quality production of honey for local customers. It suffered a destructive fire in May of 1875. Another mill was erected, but it too fell prey to fire in December 1876. The Plewes bought the burnt-out site and constructed the present day mill in 1877. Later that same year saw the digging of the millrace pond, which still stands beautifully today. The pond was first powered by an overshot water wheel and later replaced with a turbine wheel, which powered the mill until the mid fifties. The Plewes mill ground grain and made flour and oatmeal. Other operators of this mill were John McGowan, Amos Bell and George Walters. In its last years of operation the mill was an alfalfa meal operation. The final owners (present day owner excepted) ran a Mill House Store out of this historic building which stands majestic in our new millennium. In its ‘heyday’ Kimberley thrived with commerce. William Purdy ran a small store and post office. We had a brick store, and a butcher shop, which delivered meat by a specially built wagon, fitted with ice trays. Mrs. Curry, the butcher’s wife tended to the store which had cured and salted meats, as well as tallow sold in large cakes for waterproofing leather boots and shoes. Later a grocery store came along, which also featured a barbershop. The lyrics “Shave and a haircut, 10 cents” were true to form back then. For a time, Kimberley even boasted two butcher shops. Later, circa 1903 a bank was opened and later was taken over by the Bank of Montreal (until 1923). At a later date Kimberley has a gas station and a creamery. With further growth came two hotels, three blacksmith’s and still standing is The Beild Place, north of the Kimberley bridge, right beside the river on the east side. Two woodworking shops (creating beautiful carriages, farm sleighs and wagons) and numerous other businesses including a restaurant (known as the Kimberley Grille), a shoe store, a tailor and a dressmaker. One of the hotels was a temperance hotel known as Traveller’s Lodge. The hotels were located at opposite ends of the street. Eventually a strong Temperance Organization was instrumental in stopping the sale of beer and liquor at Condy’s hotel. In 1903 residents of Kimberley began discussing piping water in their homes. The source would be the strong springs near the base of the east mountain. Ten shareholders supplied money and labour to construct a concrete water tank near the spring and lay pipes in a hand dug trench to the village. The spring was located on Mrs. Matthew Ferguson’s farm, thereby awarding her one share in return for the use of her land. By 1910 the project was completed and ten families in Kimberley enjoyed the luxury of fresh spring water running into their homes. In 1912 water was offered on a yearly rental basis of $8.00. Three renters came on board. Thus began a cooperative effort, which we enjoy to this day. petitioned to take Kimberley from a ‘hamlet’ to a ‘police village’. The petition was passed on November 26th 1916. Today, we are once again known as a ‘hamlet’. In 1920 another petition was passed to erect a new community hall. The hall was completed in 1922 and today it’s known as the Kimberley Community Hall and Library. This historical building can be attributed to the tireless efforts of residents and the on-going support of The Women’s Institute and Department of Agriculture. This hall was dedicated to the young men who had given their lives in the war of 1914-1918. 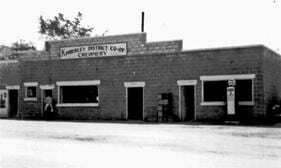 Progress came to Kimberley in the latter part of the 20’s in the form of Hudson Motor Company. They utilized the steep hills on either side of the Valley to test the power and endurance of their automobiles (much like today’s valley ‘test’ drivers; wow, life does come full circle!!!) Every summer professional drivers and engineers brought their machines to the area for the grueling tests until the depression put an end to these exercises. The building which today houses Sea & Ski Realty once housed the Kimberley District Co-operative. It operated from 1946 to 1973 (operating at a loss) when it was sold to Gay Lea who bought their ‘Milk Quota’ and subsequently sold again when the government offered a $50,000 incentive for it to close. Much later, Bud Hoffman purchased the building and operated a ski shop and restaurant. It was sold on and off to various owners, some who also ran a restaurant. Finally, from approximately 1990 to 2000 it was put up for sale until the time Sea & Ski purchased it in mid summer of 2000.